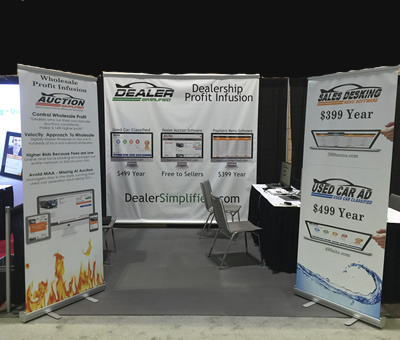 The team from the Digital Dealer Conference welcome Dealer Simplified LLC to their debut product presentation at the well known dealer conference. “We are honored to be part of the show and rubbing shoulders with so many prestigious automotive vender's and dealers.” said Kevin Leigh co-founder of Dealer Simplified. He and his partners, Phil Gates and Dave Kaiser started the company in 2014. The company has been called the “David to the traditional auctions Goliath.” By Automotive News. Sales Desking (found at SalesDesking.com) a menu selling system for the showroom floor. Used Car Ad (found at UsedCarAd.com) a used car classified website with localization. Co-founder Kevin Leigh will also be speaking at the event on Thursday April 23rd at 10am. Presenting on the topic “digital marketing for wholesale.” Which will help dealers get started webify their wholesale operations.